The territory formerly known as Syria is currently under control of at least five military factions, including Islamic State in the east, the Turkish army in the north, and anti-government forces just outside Damascus. Major cities are entirely destroyed; there is no national economic plan and no national economy, yet, shortly, a Syrian representative will submit targets and commitments for the cutting of CO2 emissions. This case shows how climate change agreements occur in a separate, estranged world, isolated from the realities or needs of peoples on the ground. A CO2 target can come before there is a national economy; spokespeople can make climate change committments before there is a country to speak of. 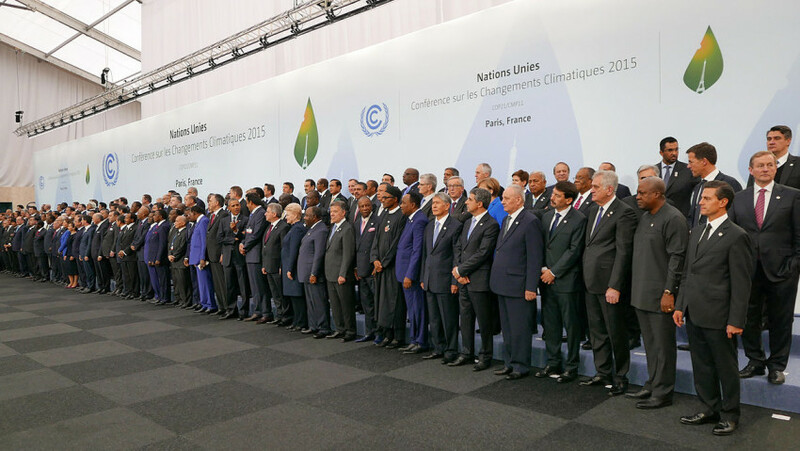 When they enter into climate change negotiations, leaders leave their populations behind. They enter a different sphere and a new way of doing politics, which deals not with human needs or priorities but with technical or naturalised targets. Climate change provides a post-political and technocratic language, through which deals can be done and relations negotiated. To sign up to the Paris Agreement, or to support the ‘2° target’, is to enter into an intra-elite pact. It is like an initiation to an exclusive society, where you assume different priorities and take on a different worldview. Your loyalties to your secret society (your international obligations, international contributions) take priority over and occlude one’s obligations to domestic populations. The international sphere now has some similarities with the situation for absolute kings in ancient times: the political relations are those between leaders, not between leaders and populace. The international sphere is a plane for political relations between leaders, which occur relatively independently of their respective peoples. Climate change features as the ideology of this sphere, not because of a natural emergency, but because the issue represents, in essence, the negation of the national political sphere. It is global not national, natural not political. Countries’ submissions laying out their planned CO2 cuts (their Intended Nationally Determined Contributions) make strange reading. A country is described – its geographical position, economic resources, industries – but the framing is from an estranged, alien point of view. Elements of human and geographical reality are described only for the reason of explaining targets for the reduction of CO2. All of a national reality is viewed from the point of view of the amount of gas produced; it is seen from the skies, from a perspective that would not be recognisable to the people in that country. A country’s ‘contribution’ to the world becomes, not its inventions or production of ideas or products, but its limitation on the production of a gas. CO2 becomes the mediator in international political relations: it is the asocial currency, the means by which one national reality is made comparible with another. This worldview is not just indifferent to people’s priorities; it is, loosely speaking, the opposite of them. Fiji’s contribution document regrets that the ‘addiction of modern society to individual transport options’ has led to an increase in car ownership, and that ‘engine size distribution is moving in the wrong direction for energy and emissions savings’. A country with a per capita GDP of US$4000 dollars sees the modest increase in the private motorcar as obstructing its ‘international obligations’. Of course, there is horse-trading over economic interests at the climate change conference. The world is divided into two groups of countries: those who must contribute towards the Green Climate Fund, and those who receive these funds. Poorer countries are pushing for more climate relief money and for a review of richer countries’ failures to meet past climate targets. Richer countries are resisting. Turkey is complaining that it is in the wrong group, claiming that it should receive climate funds rather than be asked to contribute. Yet here, socio-economic problems or goals are discussed only indirectly. Relations of economic competition, or exploitation, can only be understood through the medium of CO2. Countries relate through the intermediary of the skies, as the emissions from one part of the world rain down in the form of hurricanes or flooding on another. Human ends are only sought as the side-effect of natural ends. Aid becomes ‘climate relief’, not tackling human need but tackling the ‘effects of climate change’ on poorer regions. The countries thrust to the forefront of negotiation are those who, through accidents of geography, are exposed to earthquakes, hurricanes or flooding. The poverty of those on higher or firmer ground is not so interesting: it has not been touched by natural intermediaries, but only those old profane socio-economic forces about which we have very little to say. National domestic interests are not expressed or dealt with directly: they sit there silently, sullenly, at the back of the room. Germany is embarrassed by the fact that it can’t close its lignite mines or penalise its car industry. The things that matter domestically – cheap energy, jobs – are not the things that matter in these negotiations. Domestic economic interests are things to be whispered about in private. When the French president travelled to India, the leaders gave a joint press conference about the need to back the Paris Agreement and tackle climate change; then they retreated to private discussions about the export of French war planes. There is a public face and a private face. There is nothing wrong in principle with an international negotiation about the global environment. One could imagine a situation, in some future world, where a committee representing the whole of humanity could come together to make decisions about the earth’s climate: to reduce CO2, to seed rain, to increase or reduce temperatures. These representatives would bear the wills and wishes of their respective sections of humanity, and the conclusions would be the outcome of these accumulated wishes. This is not what we have. International climate change negotiations provide a new post-political sphere, which is not an offshoot of national peoples, but a different plane, insulated from and set against them. A meaningful discussion about our collective influence on the climate could only be based on the realities and wishes of the world’s populations. Scrapping climate treaties would be the first step in bringing politics out of the sky, back down to earth – to the profane and solid ground of human need, reality and desire. 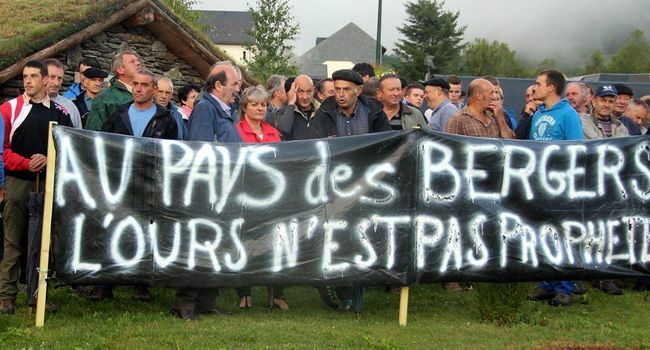 Throughout the French Pyrenees, large paint letters are stamped out on high mountain roads: ‘Ours Non’, No to Bears. Bears were reintroduced by the French government in the late 1990s, starting a long ferocious battle with shepherds and sheep farmers. At the last bear release in 2006, hundreds of farmers mobbed the release site, daubing red paint and smashing windows and lighting fires. This summer bears chased 200 sheep over a cliff edge, sparking demonstrations and demands for the bears to be removed from the Pyrenees. When state wildlife experts visited the affected area, a group of farmers fired shots towards them and slashed their car tires. Over decades, centuries, farmers had sought to eliminate the predators that were tormenting their flocks. No sooner had they succeeded, the government reintroduced them – only this time from Slovenia, and as a protected species. The state introduced a predator that preys on flocks and forbade shepherds from touching them. The Pyrenean bear is an example of what has been called ‘rewilding’, the reintroduction of species that had been hunted out of existence. Rewilders want to bring the bear back to the UK – an even less suitable location – along with the lynx and the wolf. Rewilders hate sheep and they hate sheep farming. The environmentalist George Monbiot says that sheep farming has turned the Lake District into a ‘desert’, with only a small proportion of the species that would populate a wild forest were it allowed to go to seed. Yet the Lake District is not an ecological model; it is a landscape that has been made and remade through continual work and effort. What is beautiful about the Lakes is not only the shapes of the fells and crags revealed by sheep cropping, but the ways in which the hills are criss-crossed by the paths of people and their animals. The sheep farmer James Rebanks says that he looks down from a fell and sees a landscape ‘crafted by largely forgotten working people’: ‘a unique man-made place, a landscape divided and defined by fields, walls, hedges, dykes, roads, becks, drains, barns, quarries, woods and lanes’ (1). It is the shepherds who know what nature is and how it works. If you talk to a high mountain shepherd, who lives in a hut for months on end, he knows every rock and crag, the call of every bird, all the moods and rhythms of the weather. He knows nature because he works upon it. Similarly, the families who have farmed the Lake District for generations are welded into the landscape; they are grounded in a place in a way that we can barely imagine. Rewilders’ version of nature is a fantasy, committee-room nature. It was people sitting in committee rooms in Paris who thought that it would be nice to bring back the bear. Perhaps they imagined nature films of roaming bears and their cubs, or thought of the bear logo on Pyrenean produce. The ideal of wilderness comes from people who rarely experience it, or only experience it in an aesthetic or fantastical manner, as some kind of antidote to the jaded effects of urban life. (The US environmentalist Timothy Treadwell romanticised the bear and lived with them for years, but he did not know the bear, anymore than children know bears, which was why he was entirely surprised when a bear eventually attacked and ate him). It is by working upon nature that we come to know it in its reality. Before agriculture and farming, nature was a mystical world peopled by spirits and animated by mysterious forces. With agriculture, people started the business of taking hold of nature and attempting to mould it; they knocked up against the reality of animals, plants and rocks. Slowly, ideas of spirits and mystical forces began to dissipate, and incipient scientific understandings developed: they came to understand how plants reproduced, what they required to grow, how animals could be bred and tamed. This collective experience is preserved in myth, such as in the labours of the Greek hero Hercules, with his contests with hydras and monstrous beasts that are terrorising villages and towns. Hercules’ labours recapitulate the origin of civilisation, the work that was required for the founding of cities. Rewilders complain that the wolf has been unfairly demonised, as if it is only fear and misconception that are preventing packs of wolves from happily loping around English hills. Yet the demonisation of the wolf is the legacy of the centuries of wolf hunts, the paying a bounty for wolf tongues, the effort of making a land where flocks are safe from attack. Indeed, the British landscape owes its distinctive idyllic quality partly to the successful elimination of the wolf, which was possible as an island. The elimination of the wolf was the work of our ancestors – something they won for us, for our peace – yet now rewilders want to undo this work and reverse it. Of course, there are still genuine wildernesses in the world, largely in areas not suitable for agriculture or in unpopulated regions which have been set aside. People can still go to these places to experience an untouched raw nature that seems to be outside of human time and history. But the Pyrenees or the Lake District are not wildernesses. Indeed, the main visitors to these areas are walkers, whose interests very much coincide with those of the sheep farmers. Walking in a forest is fine for a bit but after a while is very dull: you see nothing and could be anywhere. Without sheep there would be no views below 2000m in the Pyrenees and none at all in the Lakes. Grazing allows you to experience the mountains as mountains, rather than as the same old trees stretching in all directions. Pyrenean sheep farmers have told me that they feel that they are being pushed out of the mountains; they feel that the powers that be are hostile to them and their way of life. Conservationists argue that the numbers of sheep lost to bears each year are relatively few, about 300 out of 600,000, and that far more animals are lost to illnesses and accidents. Yet the issue is not only the losses sustained, but the meaning of these losses. The threat from the bear isn’t an accident; it’s an attack. The state has reintroduced a predator that is protected and has 150 people monitoring its wellbeing. Farmers have been forced to build defences, to put up electric fences, bring back mountain sheep dogs and full-time shepherds. Reintroducing marmots, beavers or kites is one thing, but when it comes to predators of flocks there is a line. To take the side of the bear is to take the side of the hydra against Hercules: it is not only an attack upon farmers but upon civilisation.